Established 1918 as U.S. field artillery training center. 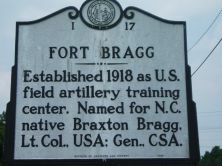 Named for N.C. native Braxton Bragg, Lt. Col., USA; Gen., CSA. 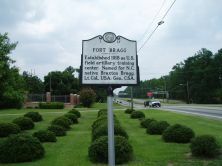 Fort Bragg, a 300-square-mile military facility that is home to the 82nd Airborne Division and United States Army Special Operations, was authorized in August 1918 as Camp Bragg, a World War I training center for artillerymen. Initially, the base was designed to support Camp Greene, an infantry training center in Charlotte. However construction on Fort Bragg was not completed until after the armistice was signed and the war had concluded. Upon completion in 1921, the site was named for North Carolina native and Confederate General Braxton Bragg. On September 30, 1922, the name was officially changed to Fort Bragg. Pope Air Force Base, located on the northern perimeter of Fort Bragg, was originally authorized in 1919 as Camp Bragg Flying Field. Prior to World War II, Bragg’s compliment of artillerymen was never higher than 3,000, although facilities were built to hold 16,000 soldiers and 5,700 horses and mules. During the 1930s the base fell into disuse, and the buildings became quite dilapidated. In 1940, as America began its military buildup, Bragg’s barracks and base hospital facilities underwent massive redevelopment. By 1941, the post could hold nearly 60,000 soldiers, making Bragg the largest United States Army base in the nation. Dozens of artillery units, as well as the 9th Infantry Division, and the newly formed 82nd and 101st Airborne Divisions, trained at Bragg. The airborne units and their glider components, pioneered by General William C. Lee also trained at nearby Camp Mackall and Laurinburg-Maxton Army Air Base prior to their airborne assault at Normandy on June 6, 1944, as part of the D-Day operations. After the war Fort Bragg was the home of the first fully integrated army unit, when the 555th Parachute Infantry Battalion, an all-black unit, was incorporated into white regiments of the 82nd Airborne Division in 1946. As the military demobilized and the 101st Airborne was transferred to Camp Breckenridge, Kentucky, following World War II, Bragg’s population fell to 20,000, but increased to over 40,000 during the Korean War. In the 1960s, the base became the home of the United States Army Special Forces, more commonly known as the Green Berets. The John F. Kennedy School of Special Warfare at the base evolved out of the Army’s Psychological Warfare Center, which was transferred to the post in 1951 from Fort Riley, Kansas. In addition to World War II and Korea, Fort Bragg soldiers have participated in missions in Vietnam, the Dominican Republic, Grenada, Panama, the Persian Gulf, Haiti, Bosnia, Afghanistan, and Iraq. Virtually all forms of United States Army training and activities, with the exception of major armored forces, are present on the base. Currently, Fort Bragg is one of the largest military bases in the world, encompassing nearly 161,000 acres and housing 45,000 soldiers as well as employing 8,000 civilians. Expansion is planned as a consequence of recent base closings and realignment.